Bearing in mind that most of the deposits were mined in the early 1900's for their high-grade ore, it is interesting to note that most of the deposits have had only minor production. By far the largest three areas of production occurred with the Central mineral belt, and this included the Eva, Meridian, Thor and Silver Cup deposits. There has been inconsequential production from the Lime Dike and Southwest Mineral Belts. The following maps shows the historical tonnage produced out of each of the mines relative to each other up until 1986. It is not a map showing the total resource potential, and this is an important distinction as explained below! 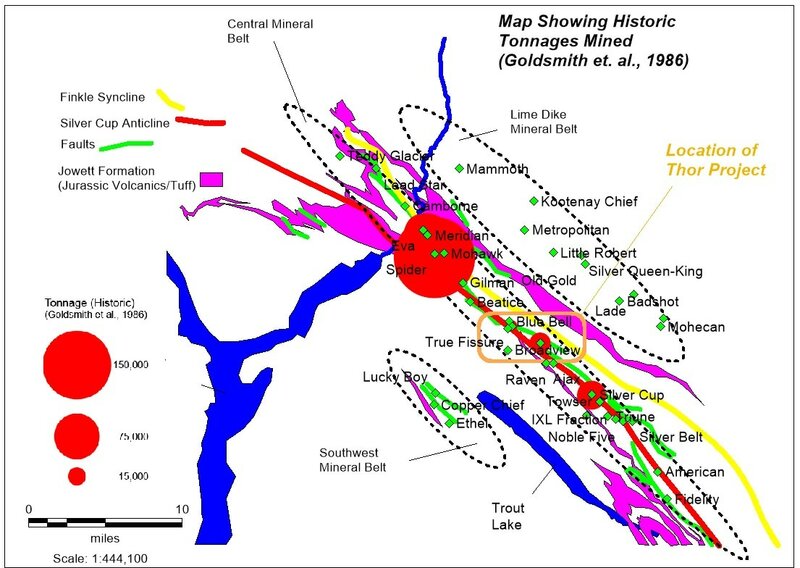 When the tonnage map is contrasted to the metal values for the deposit, there is a clear relationship that the deposits with relatively high base metal content have had significantly more production. There is also a clear correlation between the occurrence of the volcanic Jowett Formation and many of the deposits in the area, and this becomes very important when the genesis of the deposits is understood. VMS deposits are always found in close proximity to intrusive/volcanic units, and this certainly appears to be the case in the Silver Cup District. It is very important to note that while the historic mined tonnages may be relevant to assessing potentially how large a deposit could get through continued exploration (deposits with high-tonnage potential typically have had more historic mining activity in the past), there is considerable upside in many of these larger deposits to expand the high-grade mineralization beyond the original deposits. This is critical at Thor, and in fact the tonnage of this deposit has grown from a Historic tonnage of approximately 20,000 tonnes to a deposit that is now known to well over 1 Mt in size!